The Right Choice For Almost Everyone! A Valentine chocolate gift is such a great way to celebrate one of the sweetest holidays of the year. In spite of all the commercialism surrounding these types of holidays, I manage to jump right into the spirit of things and have a great time. Even as a child I had such fun preparing Valentine's Day Treats for my family and friends. I've always loved the traditional heart shaped box of chocolates. Don't you? But I have to admit that I especially like finding Valentine Gift Chocolate that is a little bit different. It's a way to show those I love how special they are to me in a way I know they'll appreciate. To start, here's a really wonderful selection of Valentine day chocolates from which you can choose the perfect valentine chocolate gift. I also recommend that you visit Dan's Chocolates for a gorgeous velvet heart box of chocolates, if you are looking for that traditional gift. Of course, that's just one of their delicious choices available. 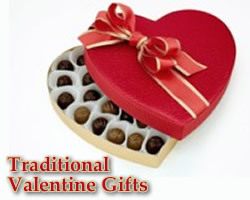 If you have a lot of people to give Valentines gifts to, you may want to consider wholesale valentine chocolates. You can often save when you buy in bulk. Perhaps you want to make your own valentine chocolates. If so, I've got some delicious valentine chocolate gift recipes farther down this page to give you a start. 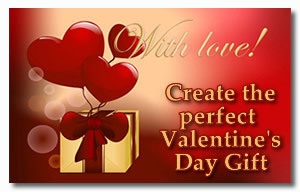 You can present a valentine chocolate gift in a variety of ways. I don't care very much how I am presented chocolate as long as I AM presented chocolate, :) but I do feel treasured when someone takes that little bit of trouble to make the gift extra special by making a unique presentation. Try one of these great ideas, or create a design of your own. If you do come up with a clever inspiration, I'd be so pleased if you would pass it on to me to share with the rest of my visitors. Thanks! Purchase a novelty mug or large tea cup and fill it with individually wrapped homemade chocolates. You can also purchase a selection of individually wrapped chocolate bonbons. Wrap the filled mug with clear or colored cellophane and secure at the top with a ribbon. For a different take on the gift mug, try making a chocolate bouquet. Fill the mug half way with foam and arrange a selection of "flowers" made of wrapped chocolate bon bons on skewers, wire, or floral picks. For more detailed instructions visit our page on chocolate candy bouquets. For a valentine chocolate gift with an elegant look, fill a wine glass or goblet with a selection of decadent chocolates. The stem of the glass can be dressed in a bow or glittering ribbon. If you are having a special dinner, use this idea to dress the table at each place setting. You could even sprinkle heart or lip shaped confetti around the base of the glass for added color and ambiance. Choose a glass or ceramic candy dish. Don't be afraid to veer away from the traditional clear glass. You could go with a dish that is heart shaped, or shaped like a favorite animal or object that is significant to the person you are giving your homemade chocolates to. Simply arrange the chocolates on the dish and place the dish on a large piece of cellophane drawing all corners up to a point and securing with wire or tape and a pretty ribbon. You don't have to stick with the traditional red, white, and pink color theme. Cellophane comes in a wide range of colors. Look for unique miniatures that have sections that can be filled with chocolate candy. For instance, a toy train, pick-up truck, wheel barrow, boat, umbrella, hat, or any other miniature that you think will suit your purpose. Just keep your eyes and mind open and you will be surprised at the number of options you have. Have fun with this. Whoever receives your unique creation will always remember that clever valentine chocolate gift. Along the same line as the miniatures, you can choose from a wide range of containers to use as "packages" for your valentine chocolate gift. You can use a basket a box or a tin. I have seen plastic containers with lids in a range of shapes like hearts, stars, circles, etc. Again, keep your eyes open and collect these items even before you need them. I scout out containers after each holiday when the prices have been drastically reduced. You can really pick up some bargains to set aside for the next time you want to favor someone with a presentation of chocolate candy. I use them for homemade treats or even fill them with a combination of favorite gourmet and everyday chocolates. You can get just about all the supplies needed for these projects at Candyland Crafts and JoAnn Fabrics or some other craft store. Except for, of course, the chocolates! To get an idea of the variety of things you can get from different suppliers check out my recommended chocolate candy sellers. You'll have a ball picking out your gifts whether you make them yourself or splurge on the "good stuff."